Black, White & Neon Bright! I'm not big on the neon trend or trends in general, for that matter! I like to play around with colours and styles, but not because they are on trend, just because it's fun! There have been a lot of neon bright accessories and items of clothing at stores lately and I have found myself drawn to them simply because I love wearing colourful outfits in recent times, neon or otherwise! 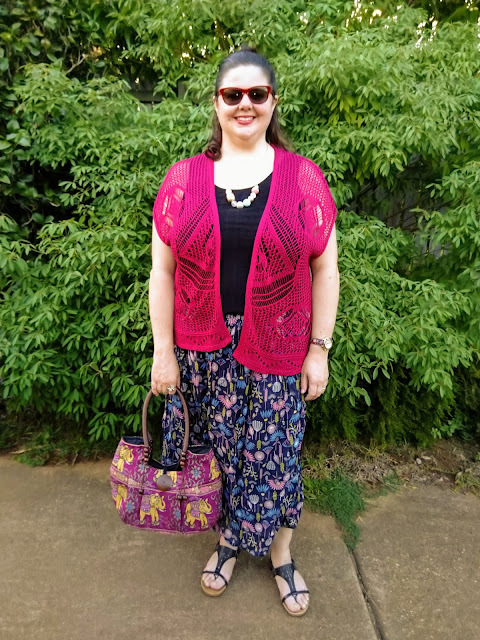 In the first outfit, the skirt and cardi are both new additions to my wardrobe. I was first drawn to the black and white print of the skirt and the pops of neon running through it. 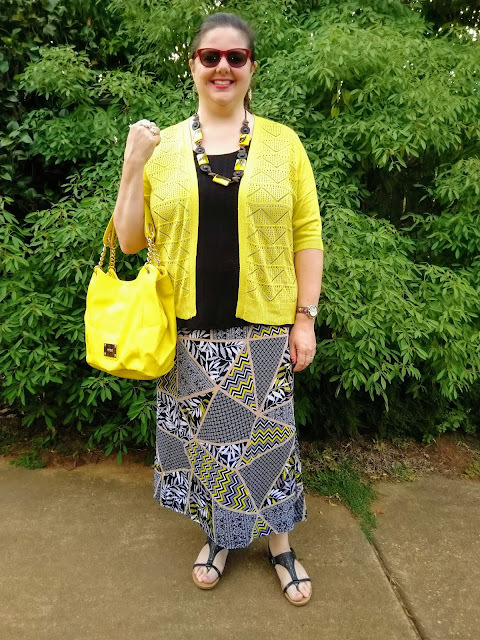 The cardi was then bought on sale and is a perfect match to the skirt! I usually wake up with a particular print or colour scheme in mind for putting an outfit together. I usually don't plan ahead with what I'm going to wear, as I like the spontaneity of choosing something I'm in the mood to wear on the day. 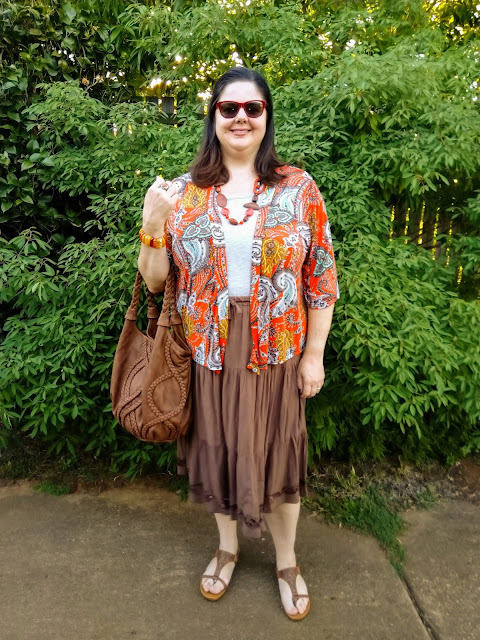 That's all well and good for most days, but on days that I sleep in or am running late, I usually default to something very plain and basic and grab a fun and colourful necklace on the way out the door! As you can imagine, I also find it really hard to pack for holidays away, as I just don't like to plan my outfits ahead of time! I have got better in recent years with sticking to a particular colour scheme and then packing loads of fun (and light) accessories! In the first outfit, I had woken up in the mood to wear orange! 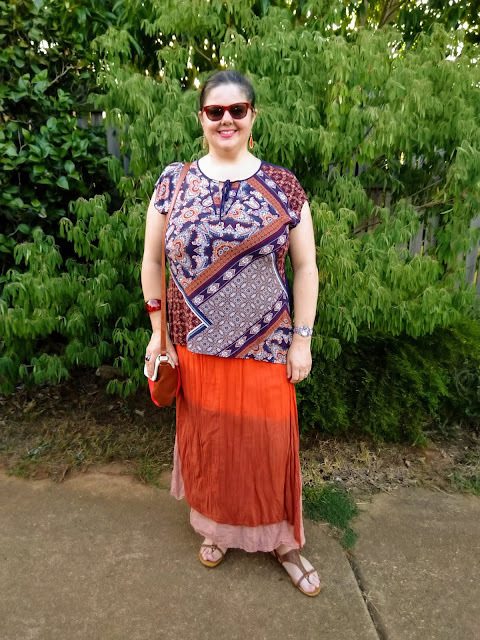 I love to wear orange with blue or green, but this time I chose to go with earthy brown colours to complete the outfit. I felt very autumnal in this outfit! Isn't it funny how some of the most basic wardrobe staples can be the hardest to find? 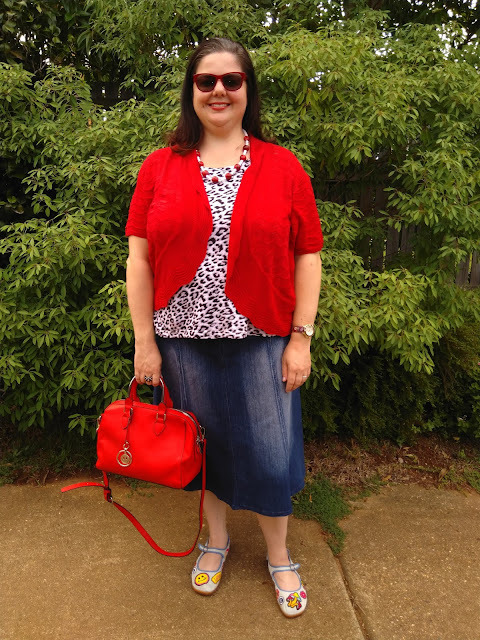 I had been looking for a particular style of denim skirt for ages and had tried lots of local shops, not-so-local shops, op-shops and online, to no avail! Last week I went to another op-shop and began browsing. I searched high, I searched low and then suddenly like a mirage, there it was: a denim skirt in my size! Woo hoo! The cherry on top was that it was only $7! Double woo hoo! With my denim desire satiated, I proceeded to investigate the multitude of necklaces. I sure have honed my op-shop skills recently, as I was able to see past the many other shiny and sparkly necklaces to find the two that I wanted! The first was the fun beads that remind me of lady bugs, worn in outfit 1. The second was the turquoise and silver one, worn in outfit 2. I like the embroidery around the pockets on both sides. Yay for cardi weather! After a long and brutally hot and humid summer, it is finally starting to cool down. We're still quite a ways away from long sleeved cardis, jumpers and coats, but I'm happy to be able to wear my colourful short sleeved cardis for now! Over the years I have built up quite a fabulous collection of cardis in many different colours and styles. They really are a wardrobe staple for me and are a great way to add colour to a neutral base. In both of these outfits I wore a black tank top as a base, chose a maxi skirt and then found a cardi to match. Easily done! 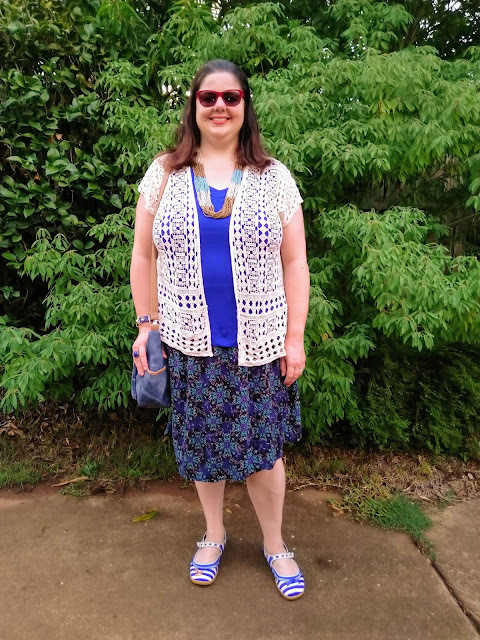 This crochet cardi is a firm favourite of mine and gets a lot of wear. It brightens up any outfit and I love the textural look and feel of crocheted garments. If only I could knit and or crochet! I have such admiration for the crafty people out there!